‘The Late Late Show with James Corden’On ‘The Late Late Show,’ host James Corden shares his support for Britain to remain in the European Union. Though he’s mostly known for his “Carpool Karaoke” on his CBS late-night show, James Corden chose to take a page from fellow Brit John Oliver’s political playbook on Wednesday night. “The Late Late Show” host spoke to his viewers — the show airs in more than 135 countries, he noted — about Brexit. Britain is voting Thursday on whether to remain in or exit the European Union, hence the name. Corden then cited a study by the IMF that states there would be a “substantial negative effect” if the UK chooses to leave the EU. 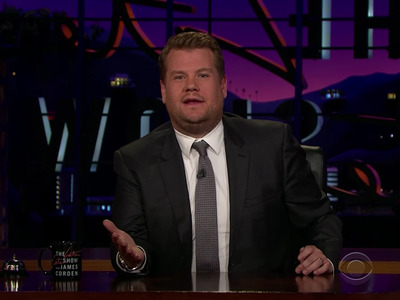 “In today’s world, I think the barriers should be coming down, not going up,” Corden said. “Wherever someone was born or wherever they live, we can share the same jokes and stories and interests, and ultimately we are all in this together and the more we embrace that, the better our world will be. Corden isn’t the only celebrity voicing their opinion on Brexit. Rita Ora, Benedict Cumberbatch, J.K. Rowling, and Simon Cowell have all voiced their support for voting to remain in the EU, while Michael Caine, John Cleese, Joan Collins, and Elizabeth Hurley support exiting.